Editor’s note: Passport to Cheese is Cheese Market News’ feature series exploring the dairy industries of nations around the world. Each month this series takes an in-depth look at various nations/regions’ dairy industries with coverage of their milk and cheese statistics and key issues affecting them. The nations’ interplay with the United States also is explored. This month we are pleased to introduce our latest country — Japan. MADISON, Wis. — Cheese may not be a traditional staple in Japanese cuisine, but demand for cheese in Japan is steady and growing. Cheese consumption in Japan is less than 5 pounds per capita per year, much less than in most Western countries, though demand far outweighs local production. In fact, Japan now is the largest cheese importer in the world, surpassing Russia in recent years since the Russian embargo against European cheese imports. Japanese cheese consumption in 2016 is expected to rise 2 percent to 292,000 metric tons (643.7 million pounds), according to an October 2015 report from USDA’s Foreign Agricultural Service. Japan’s cheese imports in 2016 are expected to rise 2 percent as well to 250,000 metric tons (551.2 million pounds) in 2016. According to an August 2015 report from Euromonitor International, recent growing wine consumption among Japanese consumers has prompted stable growth in cheese as well, since it is widely perceived among consumers that cheese goes well with wine. Among Japan’s major dairy processors are Meiji and Megmilk Snow Brand, both of which have been producing cheese since the early 1930s. Both produce natural cheese varieties such as Camembert and String, as well as processed varieties designed to suit the Japanese palate. In March, Meiji announced the construction of a new wing in its Tokachi plant in Hokkaido, Japan, to expand its Camembert production by 50 percent to 3,000 metric tons (6.6 million pounds) a year. Meiji also announced that it will enhance its production system in response to Japan’s expanding cheese market and focus on new product development and styles of cheeses. “The domestic cheese market continues on a growth trend driven by growing demand as a snack for (eating) at home and use as a cooking ingredient as well as growing health awareness among consumers,” Meiji notes in a statement announcing the expansion. Meiji adds that consumption of natural cheese has been growing significantly in recent years, exceeding Japan’s overall growth of cheese consumption. The company posted record-high sales for its cheese segment in its 2015 fiscal year, which ended March 31. In addition to a handful of major dairy processors, Japan also has a number of small artisan cheesemakers represented by the Cheese Professional Association of Japan. In 2012, Japan Airlines (JAL) teamed up with some of these artisan producers to offer a lineup of 16 cheeses to its First Class and Executive Class customers. These cheeses ranged from Camemberts, Blues and goat’s milk cheeses to Sakura, an award-winning cheese wrapped in cherry blossoms. In 2014, Japan’s imports of U.S. cheeses reached a record level of more than 50,000 metric tons (110.2 million pounds), USDA says, though volumes from the United States have since declined due to pricing and increased supply from competitors in Oceania and Europe. 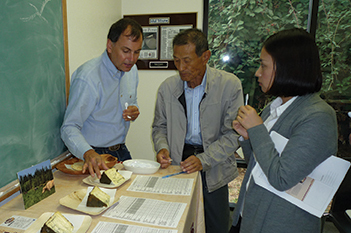 TASTING BLUES — Rogue Creamery President David Gremmels hosts a cheese tasting for buyers from Japan. The Central Point, Oregon, company has exported cheeses to Japan since 2011. Of the more than 75 million pounds of U.S. cheese exported to Japan last year, nearly half was Cheddar, according to U.S. Census Bureau trade data reported by USDA. Cheese is the biggest U.S. dairy export to Japan, according to Ross Christieson, senior vice president of market research and analysis, U.S. Dairy Export Council. Christieson notes that quality is very important to Japanese consumers who, like those in other Asian countries, are starting to eat more Western foods. Much of the commodity Cheddar exported by the United States to Japan goes into making processed cheese, while Mozzarella and shredded blends are used in foodservice for pizza. “Some of the cheese is exported in blocks and shredded locally,” Christieson says. Japan also imports a lot of cream cheese used in bakery products, as well as specialty and retail cheeses. Christieson says there is a lot of opportunity for more U.S. exports of both specialty and commodity cheeses for retail in Japan. Rogue Creamery, Central Point, Oregon, is among those specialty cheese producers who have found success in Japan. Francis Plowman, Rogue Creamery’s marketing and merchandising director, says the owner of the Hisada chain of department stores in Japan visited Rogue Creamery in 2011 after learning about its award-winning Blue cheeses that had gained international attention. The company hosted a tasting to select a cheese variety that would match the preferences of Japanese consumers. Rogue Creamery’s flagship Rogue River Blue, which has a both savory and sweet profile, currently is exported and sold at Hisada department stores. Plowman notes that when measuring the taste profiles of its cheeses, Rogue Creamery can select from certain batches that best fit the Japanese market. “The owners are sensitive to the fact that it is a different market, and they go the extra step to select cheeses that they know Mr. Hisada would appreciate,” Plowman says. In addition to exporting its Blue cheeses, Rogue Creamery has exported the beer Cheddars it makes with Rogue Ales to be sold at a store that sells a lot of U.S. beers, including Rogue Ales, in Japan. Its presence in Japan also has opened up opportunities for Rogue Creamery to export its cheeses to stores in South Korea and Hong Kong. “We’re a small company, so it’s not a simple thing for us to export to any of Asia, but certainly we’re very aware that it’s a growing market,” Plowman says. USDEC notes that in addition to cheese, the United States sees a lot of opportunity in Japan for exporting dairy proteins such as MPC and WPC-80 that are used in health and wellness products. K.J. Burrington, dairy ingredient and cultured products coordinator for the Wisconsin Center for Dairy Research, has aided USDEC over the past few years in providing training seminars for Japan’s dairy processing industry on how to use these ingredients in products such as yogurts and protein beverages. Burrington has traveled to Japan with USDEC to provide general seminars for research and development professionals and brokers on how to utilize U.S. dairy ingredients, as well as smaller on-site seminars for food and dairy companies. Last summer a group from Japan also traveled to Wisconsin to attend an ingredient seminar at CDR. According to Euromonitor, sales of yogurt and cultured milk products in Japan, based on value, increased by 3 percent in 2015, driven by Japanese consumers’ increasing awareness about the health benefits of yogurt. Growth is expected to increase in the future as well, as manufacturers are developing new products such as dessert-style yogurts to meet the diverse needs of consumers. Megmilk Snow Brand officials say its Natulait Megumi probiotic yogurt has enjoyed great customer popularity due to rising health consciousness. Meiji also reports in its 2015 results that its probiotic dairy products significantly outperformed the previous fiscal year due to aggressive marketing activities and the addition of its new Meiji Probio Yogurt R-1. Japan is one of the world’s most highly-regulated dairy markets, which means U.S. exporters have to compete with domestic manufacturers that are highly-protected. Additionally, Australia and New Zealand traditionally have been dominant in Japan — comprising a combined 75 percent of the country’s cheese imports — though the United States has grown its share in the market to around 15-20 percent, Christieson says. The 2016 National Trade Estimate Report from the office of the U.S. Trade Representative reports that Japan maintains tariffs of 40 percent on processed cheese, 29.8 percent on natural cheese and 22.4 percent on shredded frozen Mozzarella. However, USDA says a Japanese duty-free quota for imported natural cheeses to be blended with Japanese natural cheeses to manufacture processed cheese in Japan has provided new opportunities for U.S. suppliers. Christieson also notes that through the Trans-Pacific Partnership, Japan has committed to generally open up its cheese market, though many of the duty reductions will happen over a 15-year span.